The ultimate power for all your warehouse equipment needs! WINNER is a superior quality product line representing the “Total Solutions System” for a wide range of battery applications. Product characteristics include complete series with excellent reliability, long life and modern design.The WINNER Traction “Total Solution” is made in accordance with DIN and BS specifications to meet the highest technical standards of traction market. 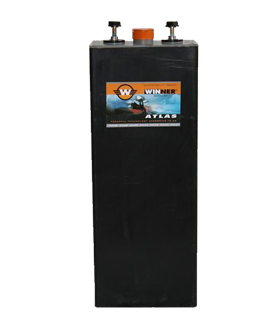 It provides full support by covering the needs for power to any kind of electric vehicles.It includes all present technologies from the Standard Tubular Plate High Performance to Gel Tubular Plate Closed type, offering complete solutions for late maintenance and power current economies.By including complete ranges of batteries, chargers and accessories, it provides the fastest technical support and services.